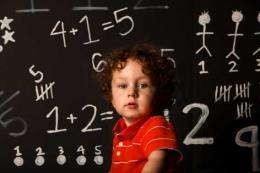 (PhysOrg.com) -- Continuing research by UC Irvine Distinguished Professor of education Greg Duncan has shed additional light on what constitutes school readiness and which K-5 skills and behaviors predict later academic success. However, one National Research Council report argues that social and emotional aptitude is just as important as language and cognition in young childrens scholastic achievement. Another NRC report emphasizes the importance of early acquisition of linguistic skills. And the National Council of Teachers of Mathematics urges high-quality math instruction for 3- to 6-year-olds. To address this issue, Duncan and colleagues identified six population-based data sets  involving 16,387 children  that included measures of reading and math competency, attention skills, pro-social behavior, and antisocial and internalizing behavior taken around the time of school entry, as well as measures of reading and math competency taken later in the primary or middle school years. We found that only three of the school-entry measures predicted subsequent academic success: early reading, early math and attention skills, with early math skills being most consistently predictive, Duncan says. His analysis is widely viewed as providing a clear answer about the relative role of school-entry skills and behaviors: Early academic skills appear to be the strongest predictor of subsequent scholastic success  early math skills more so than early reading skills. Surprisingly, chronic reading problems were not predictive of these outcomes, after accounting for the fact that children who struggle with reading tend to also struggle with math. In contrast to the first studys findings, persistent antisocial behavior was correlated to dropping out of high school and not attending college. But chronic difficulty paying attention and internalizing behavior were not predictive of this. Could it be that intelligence correlates well with later accademic success? If they did not cancel out the effect of intelligence on the accademic proficiency of the children, they might just have found the skill - in this case math - that is the most effective measure of IQ at a young age. Oh? How about parents who teach their kids to read and do math early are the same kind of parents who will help(push) the student to achive greater academic success? Or how about Schools grade/reward students (through yearly tests) on Math and Reading primarily and there for students who are not doing well in those categories would become frustrated and give up on achiving through that system? Well, being a rowdy student should also evoke a lot of negative reactions from the teachers and adults in general, and the study above pretty much rules out any effect of this negative feed-back. So why should the "frustration" you mentioned have a larger impact? The study, however, is flawed if it does not try to compensate for the effect of intelligence, and see what is really the effect of math knowledge. If they don't, policy makers could be fooled to spend a lot of money teaching young kids math, which may have little effect when compared to spending the same amount of money on other efforts.